I’ve never had my quote and my name placed into somebody else’s book. You know the kind of quote I’m talking about? Those way-too-many quotes at the beginning of books where the person being quoted probably has only read the first chapter of a book draft and then wrote something that induces you to want to buy the book – something like; “This book contains the most amazing words ever recorded” followed by their important name. Never done that. However this is my chance to write a book review because my friend Roy Goble has just written a book about wealth, faith, and God’s heart for the poor. Roy sent me a copy and asked me to write a review in my blog. Here goes . . . 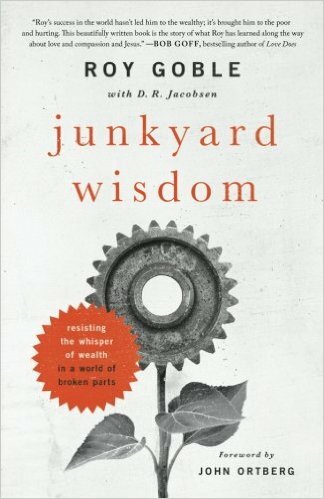 The book is called Junkyard Wisdom and I have to say it’s a book that does make you think. I’m not gonna write a review that is an over-reach, telling you how Roy’s insights have helped me lose weight, given me a six-pack, balanced by finances, and made me m ore generous and more like Jesus. Here’s what I can say. I’ve always enjoyed Roy’s mix of overt hubris (he doesn’t hide his opinion or his high opinion of his opinion) that also happens to sit right alongside of his overt desire to battle against his hubris. I mean, I know Roy asked me to write a review because he’s a type-A personality and is probably trying to get his book on Amazon’s top-seller list. Probably. But I kind of appreciate this part of his humanity because he brings all of it into his exploration of his own wealth and his own struggle with Jesus’ call to pay attention to the poor. His book does a good job reflecting his own humanity, not hiding from his own struggle with hubris and wealth and yet still wrestling to tangibly apply his faith. If you want to carefully think through the issues of wealth, and the issues of poverty in this world, and how we who are wealthy (yes you are probably wealthy) are asked to care for the poor – then I would encourage you to read the book. Roy gave me some good things to think about, and Roy is a living example of actually, tangibly caring for the poor out of the incredible wealth God has provided to him.